Children and teens from the ages of 2 to 18 should consume no more than 25 grams of “added sugar” a day – the equivalent of about 6 teaspoons – according to new guidelines issued by the American Heart Association (AHA). Six teaspoons of added sugars is equivalent to about 100 calories. The AHA is also recommending that children younger than 2 consume no foods or drinks with added sugars, according to the guidelines published in the American Heart Association journal Circulation. The statement was written by a panel of experts after a comprehensive review of scientific research about the effect of added sugars on children’s health. “Children who eat foods loaded with added sugars tend to eat fewer healthy foods, such as fruits, vegetables, whole grains and low-fat dairy products that are good for their heart health,” said said Miriam Vos, M.D., Ms.P.H, lead author, nutrition scientist and associate professor of pediatrics at Emory University School of Medicine in Atlanta, Georgia. Added sugars are any sugars – including table sugar, fructose and honey – either used in processing and preparing foods or beverages, added to foods at the table or eaten separately. Starting in July 2018, food manufacturers will be required to list the amount of added sugars on the Nutrition Facts Panel. Packing a Healthy Lunchbox, Sept. 28. Cancer has overtaken heart disease as the No. 1 cause of death in 22 states, and among some demographic groups in the U.S., according to a new report from the U.S. Centers for Disease Control and Prevention (CDC). The report by the CDC’s National Center for Health Statistics (NCHS) found that in 2000 cancer was the leading cause of death in only two states – Alaska and Minnesota. By 2014, that number had climbed to 22 states. “We’ve taken for granted that heart disease is the leading cause of death, but now because of prevention efforts and advances in treatment, we’re making substantial progress with heart disease, to the point where now it’s roughly on par with cancer,” co-author Robert Anderson, chief of the Mortality Statistics Branch at the NCHS, told HealthDay.com. The gap between heart disease and the second-leading cause of death, cancer, has been narrowing since 1968, the researchers said. Overall, heart disease has been the No. 1 killer in the U.S. for several decades. It still is for non-Hispanic whites and African Americans. But cancer is the leading cause of death among Asians or Pacific Islanders and Hispanics. From 2000 to 2014, cancer deaths among Asians or Pacific Islanders soared by 79.6 percent, from 9,069 to 16,292, compared with a 45.5 percent increase in heart disease deaths among this demographic group, from 8,949 to 13,021. Among Hispanics, the number of cancer deaths during that same time period jumped by 72.2 percent, from 21,160 to 36,447, while the number of heart disease deaths increased 31.8 percent, from 25,819 to 34,021. 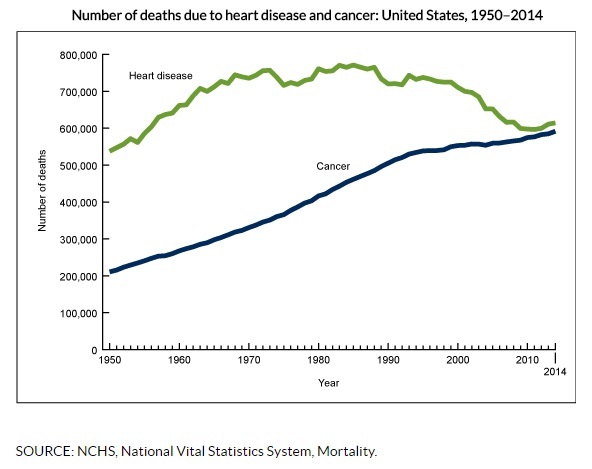 Overall, deaths from heart disease peaked at 771,169 in 1985, but fell to 596,577 in 2011. That number jumped back to over 614,000 in 2014. Cancer deaths increased from 210,733 in 1950 to 576,691 in 2011, and 591,699 in 2014.